Milli was adopted from PAW in 2005 when she was just a kitten. She lived with her family until the late fall of 2017 at which time she was returned. 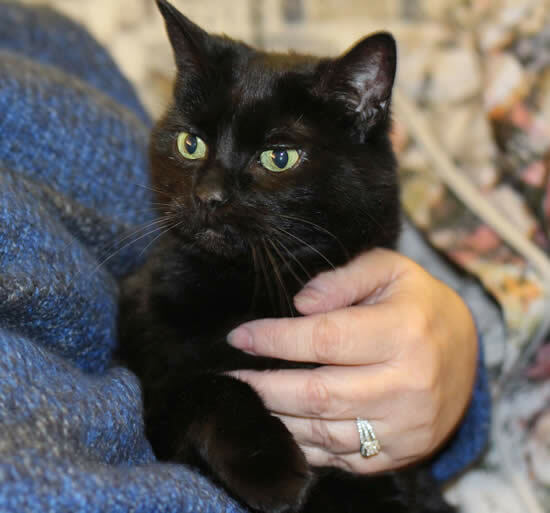 A returned cat is always a sad scenario for us but of course we'd rather have a cat come back than be given away to someone who may not provide proper care. When Milli was returned, she was suffering with a urinary tract infection and was prescribed antibiotics. Her foster family continued with her treatment and shortly thereafter a follow-up urinary analysis was performed. It showed the issue had completely resolved and there has been no re-occurrence. Feeding a good quality canned food diet is important for all cats as it promotes a healthy urinary tract. The more moisture they take in, the more their body is able to flush out the bladder (canned food is 75% water). Stress is also an important consideration and in Milli's case, there had been many changes in her little world over the last few years. In the words of her experienced foster guardians -- "Milli is a case-in-point for why we love to foster cats through the PAW Society: she came to us a bit straggled, with a big mat of fur on her lower back and plenty of dandruff. At first, she was very skittish around noises and was quite wary of the big house she now had free range of. 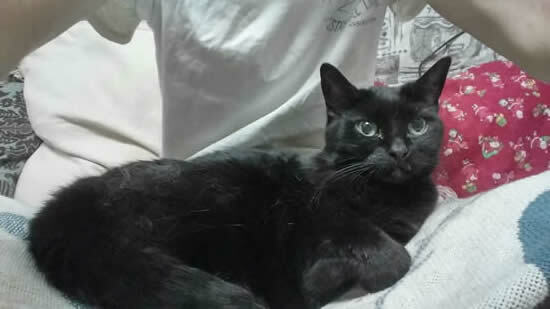 But, after a few weeks, she came out of her shell, and now she is very comfortable and extremely affectionate. She is an incredibly sweet cat and, indeed, she would be a great cat for just about anyone as she is very easy to read: when she wants to play, she’ll dig through her toys; when she wants to snuggle, she’ll follow you around hoping for an empty lap (she has an incredible “LAPDAR”); when she’s had enough, she’ll leave for a nap. There is very little that we’ve denied her, so she also loves to climb into bed and under the covers – at least, until she’s ready to sleep, at which point she’ll retire to the end of the bed. She also likes to be picked up and placed on your shoulders – but beware: she will plant wet, slobbery kisses under your earlobe. She’ll also drool profusely if she is in a very good mood and/or after you return home from a long day away." Milli likes predictability and who could blame her. We think she would enjoy a home that's more on the quiet side. Although she enjoys the radiant heat of a human lap, if one isn't available, she'll plop herself down on a floor register. For the most part, she doesn't mind her big brother Spottie but wrestling and playing with him is not her thing. She had a long-time relationship with a another female PAW cat in her previous home and, as far as we know, their relationship was friendly too.